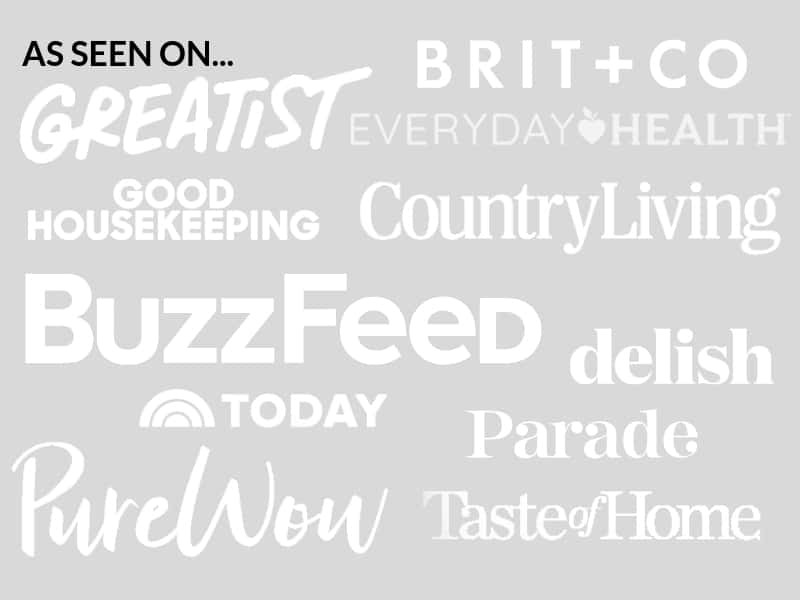 January 23, 2018 By Elizabeth Lindemann 2 Comments / This post may contain affiliate links. Oh YUM. 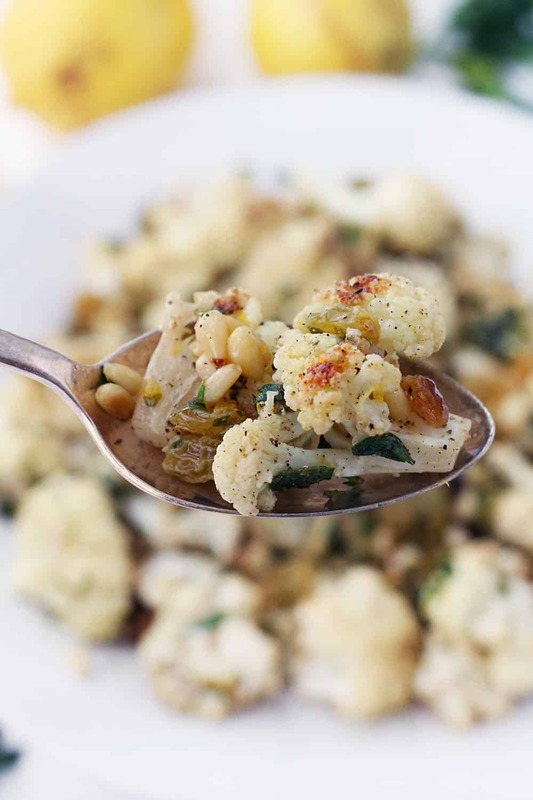 This roasted cauliflower with pine nuts and raisins has quickly become one of my favorite side dishes. 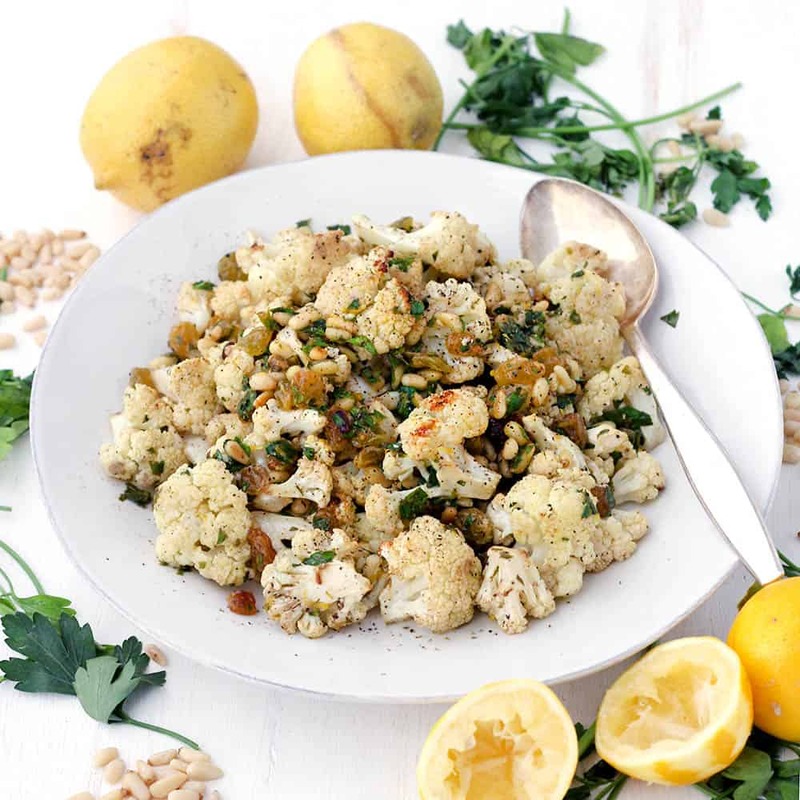 Roasted cauliflower, toasted pine nuts, and sweet, softened golden raisins are tossed in a warm lemon and olive oil vinaigrette with fresh parsley. We had it on the side of pork tenderloin last night- it would be delicious paired with just about anything. This recipe is 100% vegan, Whole30/Paleo compliant, and aligns with the Mediterranean Diet in that it’s plant-based and has healthy fats from olive oil and nuts. For those of you following along, I’ve been posting Mediterranean Diet recipes all during the month of January, to start the year off with one of the healthiest diets out there. This definitely fits the bill! If you are looking for a lower carb (or just saltier) option, skip the raisins and substitute with capers or olives instead. And if you are looking for an even more budget-friendly recipe, try chopped walnuts or slivered almonds instead of pine nuts, which can get a bit pricey. OK, so I just took a short break from writing this post to eat the leftovers for lunch. I had them cold straight from the fridge. This recipe is WONDERFUL in that it’s delicious warm right out of the oven, at room temperature, and even cold the day after! You could make this in advance or bring it on a picnic as a cold salad, or take it as a side in your work lunches all week. Because there is so little water in the cauliflower after its roasted, it didn’t get soggy either. This recipe couldn’t be easier to make. First, roast the cauliflower on a parchment-covered rimmed baking sheet in the oven, simply, with olive oil, salt, and pepper. Meanwhile, lightly toast the pine nuts in a dry skillet, then add more oil, lemon juice, and the raisins. This will enable the raisins to soften and plump slightly. 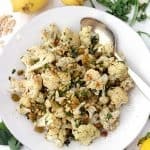 Stir in lemon zest and fresh parsley, toss the cauliflower with the dressing, and there you have it! Need a recipe to use up your leftover golden raisins from this? Try this curried chicken salad. YUM. 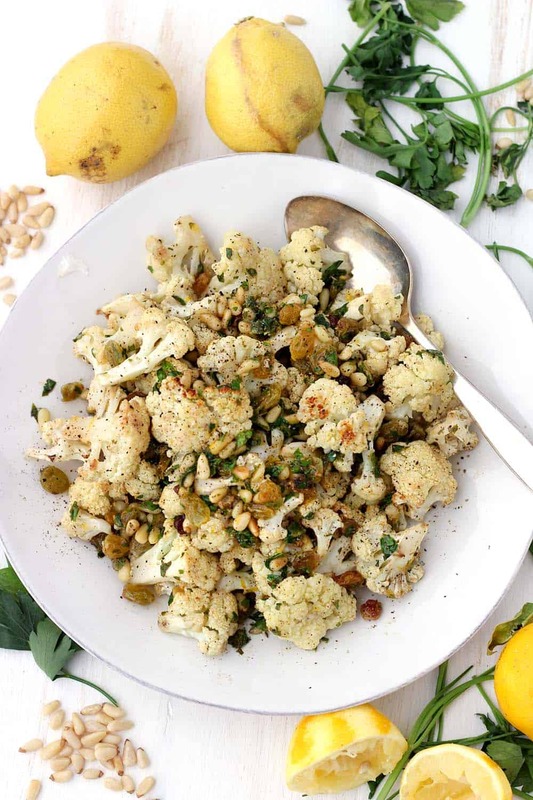 Here’s the printable recipe for roasted cauliflower with pine nuts and raisins. This roasted cauliflower with pine nuts and raisins is a delicious side dish served warm or cold. Tossed with a lemon and olive oil vinaigrette and fresh parsley, it's a fresh Mediterranean recipe that goes with just about anything! Capers or olives can be substituted for raisins for a saltier, lower carb version. Spread the cauliflower on the baking sheet, drizzle with 2 tablespoons extra-virgin olive oil, and season with salt and pepper. Toss to coat. Spread cauliflower evenly on the baking sheet and roast for 20-25 minutes, tossing once, or until browned and tender. Meanwhile, toast the pine nuts carefully in a medium, dry skillet over medium heat. Keep an eye on them- they are easy to burn! Once they begin to turn fragrant and have a light brown color, add the raisins, olive oil, and lemon juice to the skillet. Cook for about one more minute on very low heat, or until raisins have softened and plumped a bit. Turn off heat and stir in the parsley and lemon zest. 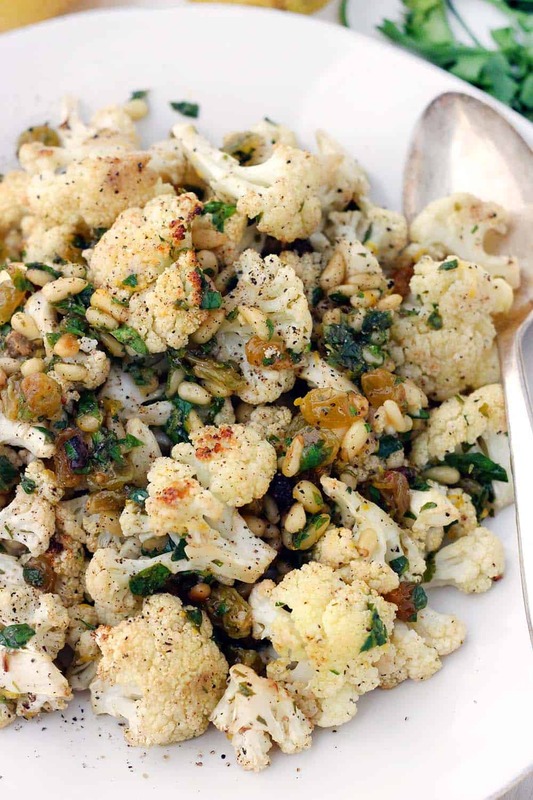 Toss the roasted cauliflower with the pine nut and raisin mixture. Serve immediately when it's warm, or allow to cool to room temperature so the flavors marry a bit. Add more salt and pepper if necessary. For a more budget-friendly option, substitute chopped walnuts or slivered almonds for the pine nuts. For a saltier, low-carb option, substitute capers or olives for the raisins. I think we’ll try this out this week – thanks. Always looking for more ways to use cauliflower.